Philippines president Rodrigo Duterte has said he wants US troops to leave the country, possibly within two years. Speaking while on a state visit to Japan, he also called for an "independent foreign policy". Under a current defence pact, the US maintains troops at five military bases in the Philippines. Since taking office Mr Duterte has strongly emphasised a pivot away from the US, a long-time ally and former colonial ruler, towards China. "I want, maybe in the next two years, my country free of the presence of foreign military troops. I want them out," he told a forum in Tokyo on Wednesday. He reiterated the possibility of cancelling current agreements with the US, as well as his desire to be "closer to China". Last week while visiting Beijing, he declared his country's "separation" from the US, though he said later it did not mean a complete severing of ties. Mr Duterte has in the past complained that the US has exploited the Philippines and interfered with its foreign policy. The Philippines is seen as a linchpin of the US strategy in South East Asia, particularly in counterbalancing China's maritime ambitions. 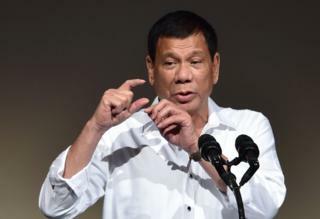 At a press briefing on Tuesday, US State Department spokesman Josh Kirby said the US was "not going to react and respond to every bit of rhetoric" from Mr Duterte. "We're going to continue to work at this relationship. We're going to continue to meet our obligations under the defence treaty," he said.